Gabon intends to use its successful bid to host the 2017 Africa Cup of Nation as a platform to win the tournament for the first time. 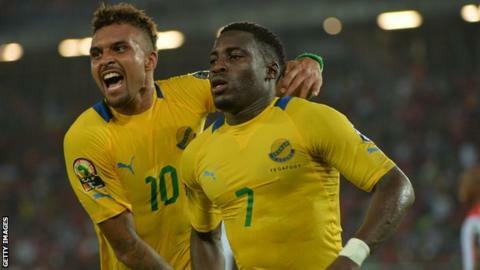 Gabon was selected as host on Wednesday by the Confederation of African Football's Executive Committee, beating rival candidates Ghana and Algeria. "We will prepare ourselves to win the Nations Cup in 2017," said Gabon football official Jean-Felix Mba Nze. "We have decided to play and win the cup." Gabon first entered the Nations Cup in 1970 but failed to qualify for the finals until 1994. Their best results came when reaching the quarter-finals in 1996 and 2012, a tournament they co-hosted with Equatorial Guinea. During this year's Nations Cup, which also took place in Equatorial Guinea, the Panthers crashed out early after winning one and losing two of their group games. The 2017 Nations Cup will be the first time Gabon has staged the finals by itself. "Our main challenge is to organise a better competition than we did in 2012," Mba Nze, the secretary general of the Gabonese federation, told BBC Sport. "I think we won the bid because we made a good presentation and we have made efforts to improve all the stadiums, hospitals and media facilities. "We are more developed than we were for the last Nations Cup." Gabon will use two stadiums from the 2012 finals - in Libreville (capacity: 45,000) and Franceville (25,000) - while adding another two. The new venues of Port Gentil and Oyem, both of which are scheduled to be 20,000-seater stadiums, are set to be ready in August 2016, five months before the competition begins. Gabon's victory was greeted with anger by both the countries it beat. Meanwhile, the Ghanaian bid told the BBC it was 'intrigued' by the decision and asked for greater transparency in the results process, asking why the Confederation of African Football (Caf) had not made the results public. In response, Caf stated that the results of voting were not released when the host countries for the 2019, 2021 and 2023 Nations Cups were announced last September.